Blaby District’s new refuse and recycling scheme, which launches next year, will now include weekly recycling collections instead of fortnightly. The Council has received £2 million funding from the Government’s Weekly Collection Support Scheme, which will allow it to retain weekly recycling collections for at least five years. It also means a reduction of only two posts as opposed to the eight posts that were to be originally lost in the move to a fortnightly mixed collection. The original plan for the new scheme was to continue weekly refuse collections, but for recycling to be collected fortnightly with residents receiving a larger 240 litre wheeled bin. Weekly collections will utilise the existing 140 litre bins that residents already have, removing the need to supply everyone in the district with larger bins. This will make the change over to the new system much simpler and easier to manage. During the two trials conducted earlier this year, the preference from residents was clearly for weekly recycling collections and many expressed a desire to keep the current 140 litre bins. It is therefore brilliant news that we are now able to do this, as well as being able to retain more of our staff than originally thought. 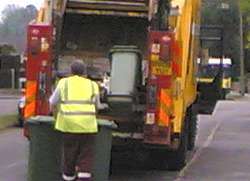 Blaby District Council will be one of very few councils providing a weekly service for both refuse and recycling for the foreseeable future. The new scheme will allow residents to put all their cans, plastics, paper and cardboard into the same wheeled bin, and offers environmental improvements by reducing the number of vehicles and the amount of fuel used, and providing less congestion on the roads. For more information on the new scheme visit www.blaby.gov.uk, email env.health@blaby.gov.uk or call customer services on 0116 272 7555 .